To celebrate UK Black History Month, we’re going to be championing the achievements of black Britons. Whether it’s in academia, sport, music, the arts or elsewhere, black people have made a valuable contribution to our country and culture for generations. As a proud Manchester organisation, we’ve decided to mark this month by focusing on people from our community, starting with Diane Modahl. Diane Modahl is a former middle distance runner who won three medals at the Commonwealth Games, including gold in the 800m at Auckland in 1990. 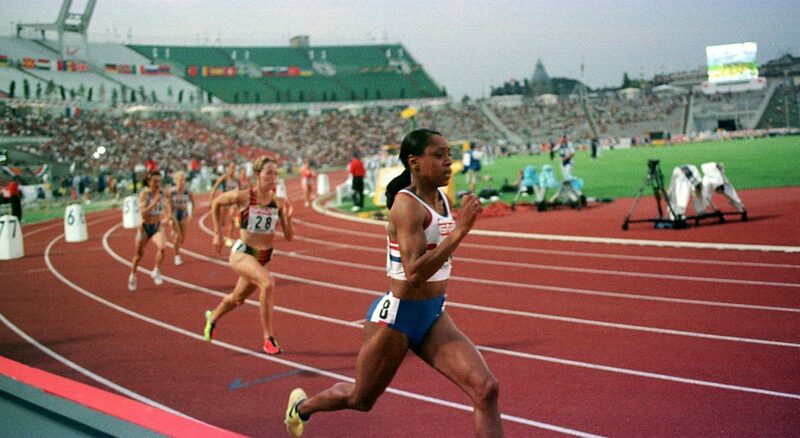 Modahl, who was born in Manchester to Jamaican parents, also represented Great Britain at four Olympic games between 1988 and 2000. Following her gold in Auckland, Modahl, from Longsight, failed a drug test. Her resulting appeal has, somewhat unfairly, overshadowed her achievements on the track; but this is largely because it was successful. While we won’t go into the complex science of the investigation, it was ruled that the lab responsible for testing Modahl had incorrectly stored her urine sample, causing it to denature. Modahl was cleared of all charges, but by this point she had already missed a string of competitions and been vilified in the press. With a mindset like that, you can see why she established the Diane Modahl Sports Foundation in 2010. As a kid from Longsight, Diane didn’t have it easy growing up. She set up DMSF to give young people who, like her, are from places like Moss Side, Hulme or Longsight, the chance to maximise their potential. Through sport and athletics, the foundation instils discipline, pride and confidence in the young people it supports, while giving them the tools necessary to apply these qualities to other areas of life like education and employment. Thanks to her services to sport and to young people in the North-West, Modahl was awarded an MBE this year. Diane Modahl MBE faced many obstacles throughout her life, including a controversy that dragged her reputation through the mud and left her financially ruined. But that didn’t stop her from persevering, from getting back on the track and ultimately focusing on helping others. Modahl has no doubt created a legacy that will inspire a new generation – from Longsight, Moss Side and beyond – to chase their goals. To learn more about the Diane Modahl Sports Foundation, head to the website.